This phase aims at designing a society of agents, whose global behavior is able to provide an effective solution to the problem described in the previous phase and to satisfy associated requirements. At this point, the problem has been modeled in terms of organizations, roles, capacities and interactions. The result of this design phase is a model of the agent society involved in the solution in terms of social interactions and dependencies among entities (Holons and/or Agents). 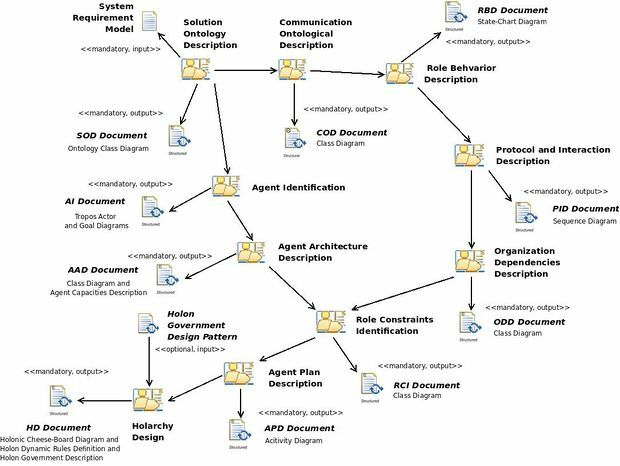 After the first activity (Solution Ontology Description), the design flow is split in two alternate paths: one concerning the social and organizational aspects of the system and the other dealing with the design of agents considered as individuals with individual goals. In other words, we can say that agents are designed as individuals owning the capacity implementations necessary to play roles composing social structures (holons). In turn, once obtained (by agents) the realization of the capacities necessary to exhibit their behaviors, holons can be considered (at an higher level of abstraction) as capacity implementation owner and therefore they can play roles in higher level holons thus enabling the composition of the holarchy. Details of activities and the set of associated work products involved in the Agent Society Design phase are reported in Figure 1. In the following sub-sections each activity will be detailed.